To all Dharma practitioners and lay devotees with deep faith and aspiration towards the teachings of the incomparable and compassionate Lord Shakyamuni Buddha and the great master Guru Padmasambhava. 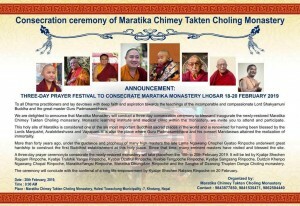 We are delighted to announce that Maratika Monastery will conduct a three-day consecration ceremony to blessand inaugurate the newly-restored Maratika Chimey Takten Choling monastery, Monastic learning institute and medical clinic within the monastery. 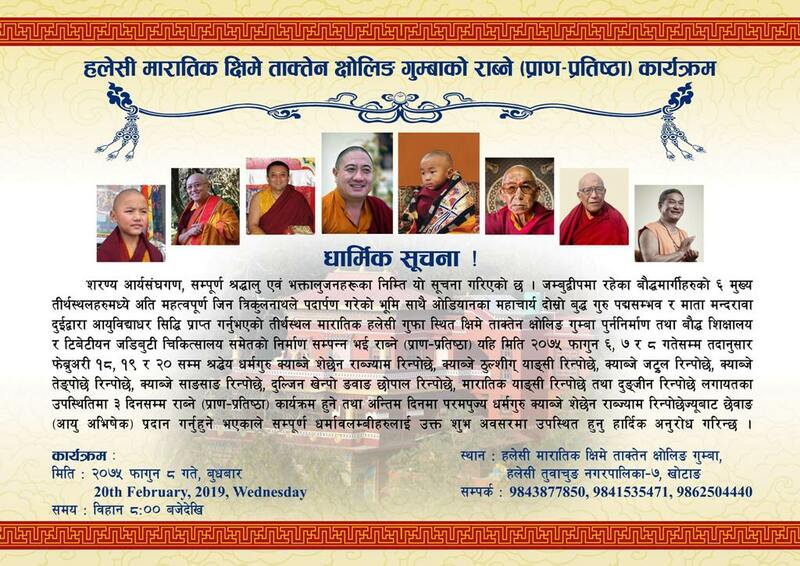 we invite you to attend and participate. This holy site of Maratika is considered one of the six most important Buddhist sacred places in the world and is renowned for having been blessed by the Lords Manjushri, Avalokiteshvara and Vajrapani. It is also the place where Guru Padmasambhava and his consort Mandarawa attained the realization of immortality. More than forty years ago, under the guidance and prophesy of many high masters the late Lama Ngawang Chophel Gyatso Rinpoche underwent great hardship to construct the first Buddhist establishment at this holy place. Since that time, many eminent masters have visited and blessed the site. A three-day prayer ceremonyto consecrate the newly-restored monastery will take placefrom the 18th to 20th February 2019. 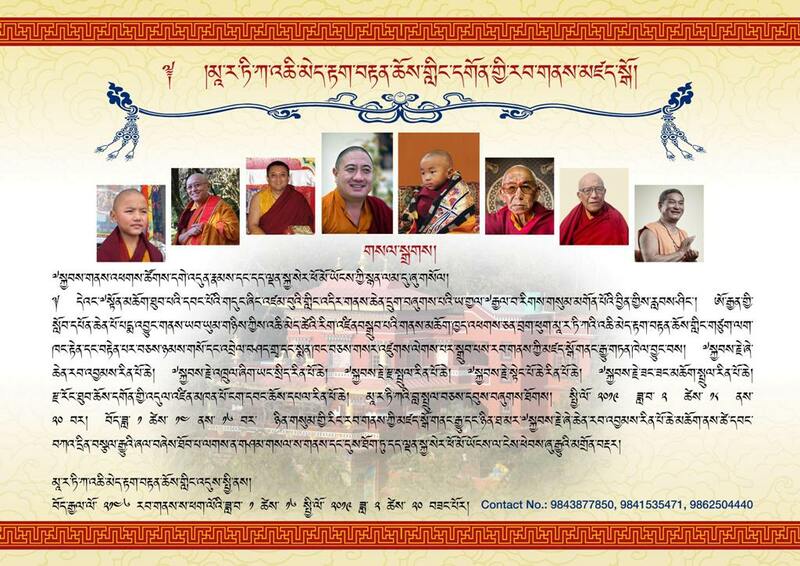 It will be led by Kyabje Shechen Rapjam Rinpoche, Kyabje Trulshik Yangsi Rinpoche, Kyabje Dzatrul Rinpoche, Kyabje Tengpoche Rinpoche, Kyabje Sangsang Rinpoche, Duldzin Khenpo Ngawang Chopal Rinpoche, MaratikaYangsi Rinpoche, Maratika Dhungdzin Rinpoche and the Sangha of Dzarong Thupten Donga Choling monastery. 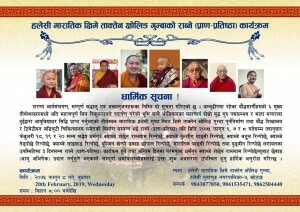 The ceremony will conclude with the conferral of a long-life empowerment by Kyabje Shechen Rabjam Rinpoche on 20 February.